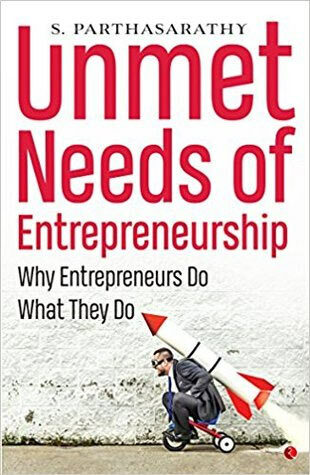 You may be an established entrepreneur or a business leader, or you may be a novice setting out on a journey in this competitive world of entrepreneurship, ‘Unmet Needs of Entrepreneurship’ is a book which will provide you interesting insights on varied areas like comprehending consumer needs, segmenting markets, improving upon skills required, setting goals, preparing yourself mentally and developing and leading empathetic and motivated teams. S. Parthasarathy uses a very simple language such that it’s easy for people with no prior knowledge in the field to understand what he wants to tell. Every section is accompanied with brilliant examples and illustrations (some which are intelligent and funny at the same time). It’s evident that a thorough research has gone behind this book especially from the angle of behavioural science. Overall a nice, enlightening read. Not only would this book appeal to the business people, but also to those who lack a proper business background and are looking to start out. Previous articleHow to improve your writing skills with these simple but effective tips?